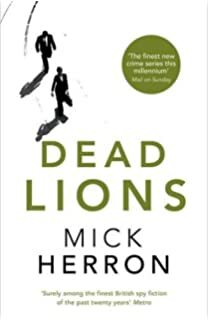 Dead Lions is the second book in Mick Herron’s series about the MI6 agents relegated to Slough House, a secret service outpost for losers and misfits overseen by slobbish, ill-mannered Jackson Lamb. I thoroughly enjoyed Slow Horses, the first Jackson Lamb book, and if anything I thought Dead Lions was even better. While Slow Horses’ plot focused on the contemporary issue of terrorism and the rise of the far-right, Dead Lions is pleasingly rooted in the tradition of Cold War spy thrillers, featuring Russian oligarchs, sleeper cells and various throwbacks to the past of Jackson Lamb – and to ‘the OB’, grandfather of slow horse River Cartwright and a former secret service agent himself. Despite the modern setting and the topical references, there’s a slight sense of nostalgia about Dead Lions which feels like a nod to writers like John Le Carré. The characters established in Slow Horses are developed in more detail: I particularly enjoyed learning more about computer hacker Roderick Ho, who might not be the most physically threatening of the team but could possibly the most dangerous. The characters are, for the most part, not conventionally likeable, yet it’s hard not to root for them, including Lamb himself, who is a man so obnoxious that he waves whisky under the nose of an alcoholic colleague and uses his own flatulence to win arguments. Together, the Slough House team form a fine ensemble cast. The dialogue is smart and witty and the narrative is full of astute observations and a satisfying attention to descriptive detail. The plot is complex and gripping with plenty of twists and surprises, and Herron clearly enjoys subverting expectations and dangling red herrings in front of his readers’ noses. It gathers pace as it proceeds, building gradually at first and then racing to its conclusion. I’ll be moving on to the third book in the series, Real Tigers, very soon, and eagerly looking forward to book four (due for publication early next year).